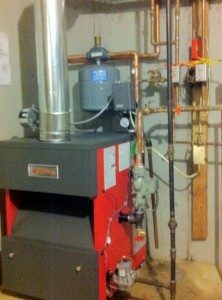 If you have a hot water heating boiler and it’s acting up, then we can fix it! Its that simple. We service every brand out there. If for some reason repair is not worth the investment or if for any other reason you choose to replace your old hot water heating boiler, we hope you will think of us for an easy and affordable solution. Boilers come in a large array of shapes, sizes and types. Don’t hesitate to ask which is the right solution for you. We have free and no obligation estimates for your convenience and allow you to make the right choice. Please check out our work section as well as our testimonials section on work we have done and what our customers think about us.